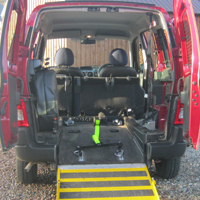 View of side access with lowered handrail and step. 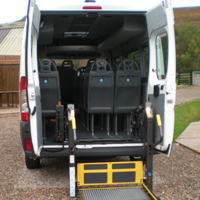 Our accessible minibus is a custom built vehicle with a lowered step and extending handrail at the side entrance. 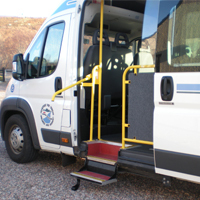 At the rear we have a hydraulic wheelchair ramp for passengers in wheelchairs or those using walking aids. 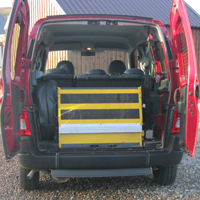 We have to remove 4 passenger seats to accommodate a passenger in a wheelchair. 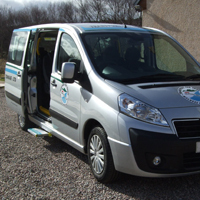 We have a 9 seater MPV which is adapted to enable us to carry a wheelchair passenger. 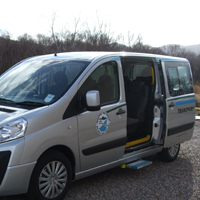 To accommodate a passenger in a wheelchair in this MPV we have to remove 2 seats and another 2 seats are inaccessible.